ALAN PEDERSEN IS WORTH THE 3 HOURS IN THE CAR! 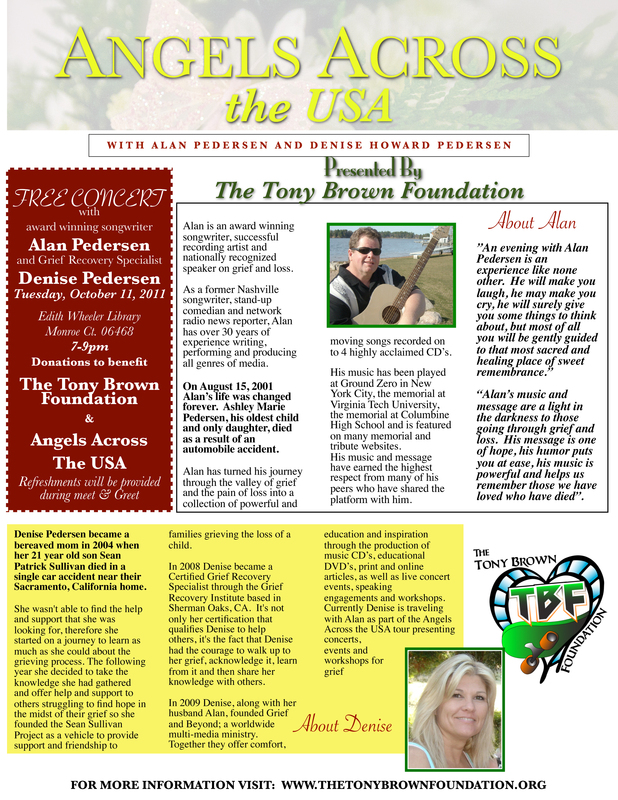 We drove 90 minutes, one way, to go to the Angels Across The USA Tour featuring Alan Pedersen last week. We aren’t working. Gas is at a premium. We’ve cut out as much non-essential driving as we can, yet we spent three hours in a car just to be with Alan.. Why? What could possibly be THAT special? I know that I have said it before and I’ll probably be saying it again and again and again. There is something so gentle, so special, so strong, caring and compassionate about this couple who met through their own losses, that I “feel better” just to be present at an Alan Pedersen Event. Think of our Grief Journey. It can be so much like the most stark and frigid of winter nights. Sometimes the wind can be howling with such fierceness that it doesn’t even block out the screaming in the head and heart of we newly bereaved. Sometimes we feel so chilled to the bone and in the deadened silence we can feel as if we are standing alone in the most vast and loneliest hole on earth. Sometimes we might look up at the gloomy, cloud heavy winter night’s sky and view not a single star. For me, Alan is like the single star which shines through that cavernous sky. He is the warm fuzzy blanket and homemade hot chocolate with whipped cream in front of the blazing hearth that beckons me in from the cold. He envelopes the heartache with a gentle understanding and knowing. He helps me to connect to Robyn. Alan doesn’t have the super power to banish the frigid night, but makes it easier to bear. His music which he has written and performs, touch my soul. They are words that I FEEL. He sings of My Experiences. Like me, he lost a beloved daughter. Like me, he felt lost and pain and didn’t know how he could possibly survive. all while freely admitting that he will grieve for his daughter not for as long as she lived, but for as long as He Lives. I HATE that I am a Bereaved Parent. I HATE that I have become a member of THE UGLY CLUB. On Tuesday, October 11, we will drive again ~ This time only an hour and 20 minutes one way, baring any traffic. And it will be worth every passing second and every ounce of precious gasoline to get there.